Bettina works and lives in London and divides her time between watercolour painting in the summer and other media in her London studio during the winter. She has been teaching and running her renowned painting holidays for more than 20 years. Her enthusiasm and expertise have helped hundreds of painters, beginners and more advanced students alike, to new levels of satisfaction and pleasure in their work. 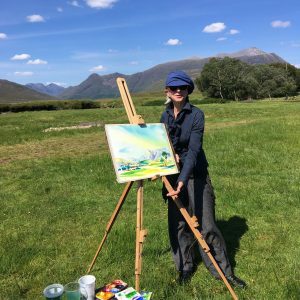 In a variety of stunning locations Bettina shares her wealth of knowledge, offering tips and professional secrets to help you improve your painting. Whether in the dunes of the Moroccan desert, the ancient landscapes of Sicily, the verdant hillsides of Devon, the Portuguese coastline or the breathtaking mountains of Scotland, a Bettina Schroeder painting holiday offers you much more than a beautiful landscape. Born and educated in Germany, Bettina moved to London in the 1980s. It is Bettina’s belief that the making of art has no limits, either in the technical sense or the subject matter. Consequently her work ranges from painting in watercolours and oils to mixed media and sculpture, and covers a wide range of subjects; landscapes, objects, portraits and details of everyday life. Most recent shows include: Frauenmuseum Bonn in Germany, Anna Göldi Museum in Switzerland, A&D Gallery in London, UK. You can view details for Bettina’s course here.